New York state residents will be able to get health insurance next year on the Obamacare exchange for half the average price available in the state today. The cost of a "silver" plan -- which covers at least 70% of medical costs, on average -- will drop to as little as $359 a month for a single adult Manhattan resident, for instance, according to a rate sheet released Wednesday by state officials. Currently, the cheapest plan a city resident can buy on the individual market is $1,001. Costs vary throughout the state. 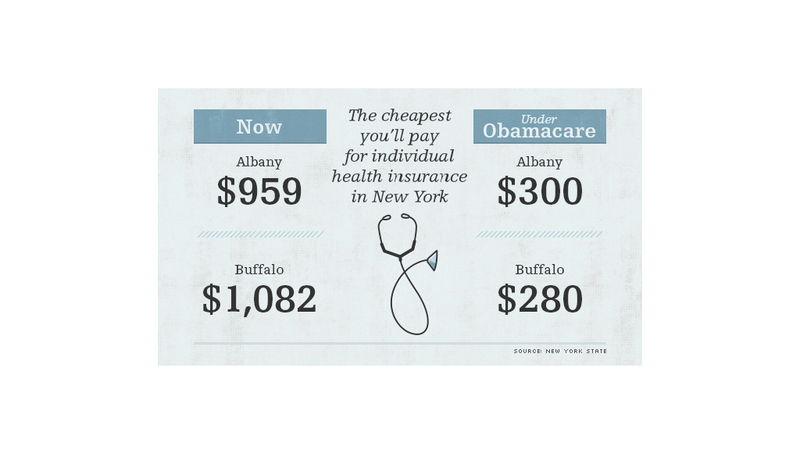 In Rochester, for example, a similar "silver" Obamacare plan can be had for as little as $276 per month. Some 17 insurers will offer coverage, which will come in four tiers: bronze (the lowest and cheapest tier), silver, gold and platinum (the most expensive). Each plan will have a standard set of benefits, allowing people to choose between insurers based on price, officials said. Those prices can vary widely within regions. In Albany, for instance, the Freelancers Co-Op will sell silver coverage through the exchange for $300 per month for a single adult. A silver plan from HealthNow New York would cost $525. The plans will also differ on the range of doctors and medical facilities included in their networks, state officials said. The wide spread in premiums for next year is largely because insurers have to base their 2014 rates on models and not actual costs. Officials expect the differences to narrow in the future. The New York rates are the latest to be disclosed as states and the federal government get ready to enroll residents in state-based exchanges in October. These marketplaces are a key element of Obamacare, formally known as the Affordable Care Act, which requires nearly every American to obtain insurance by 2014 or pay a penalty. Coverage on the exchanges begins in January. Federal subsidies will be available to those with annual earnings between $45,960 for an individual and $94,200 for a family of four, further reducing the premium cost. The Empire State is the latest to reveal premiums that are lower than current rates. Residents in California and Oregon, among others, will also have offerings that are cheaper than many plans on the market today. The administration and Democrats trumpeted the news, which runs counter to argument advanced by Obamacare opponents who said that health reform would cause rates to skyrocket. But the steep drop in rates in New York will likely not be mirrored in many other states. That's because New York is one of the few that already required many of the benefits of Obamacare, which left its individual market filled with a small pool of sicker residents and very high costs. Only 17,000 New Yorkers buy their own insurance right now, while 2.6 million people lack coverage. New York does not allow insurers to reject people with pre-existing conditions, something Obamacare also bars them from doing. And it required them to provide a standard set of deductibles, co-pays and benefits, including hospital care, lab tests and prescription drugs. That sent premium costs soaring. Health care costs per capita are about 18% higher in New York than nationally, state officials said. But under Obamacare, healthier residents are expected to flood the individual market to avoid paying the penalty. The state is expecting more than 600,000 people to enter the exchanges, with about 70% of them eligible for federal subsidies. "The people who are going to come in are healthy people who can't afford the coverage now," said Gary Claxton, vice president at the Kaiser Family Foundation. "That will substantially lower the average cost of care." The state also released rates for small business plans, but said a rate comparison was impossible because there are more than 15,000 different plans with a wide variety of options today. The rates in the small business exchange, however, are "generally lower" than estimates. The statewide average cost of a small group plan will range from $338 to $568 for a single adult for a silver plan. 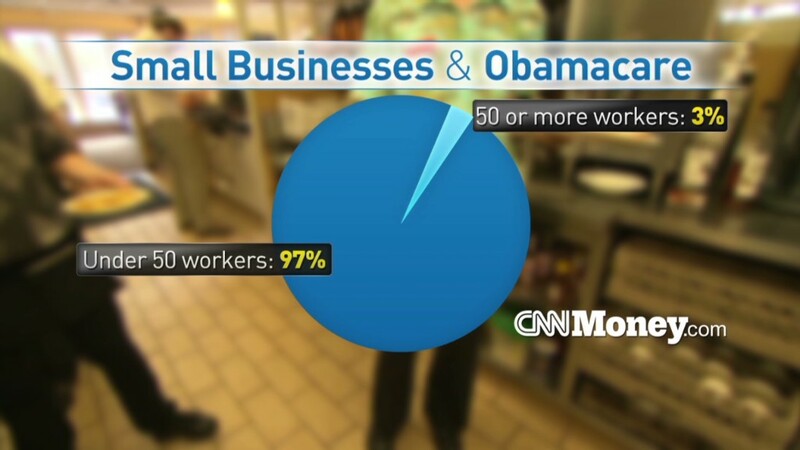 Small businesses may also opt to buy insurance coverage off the exchange. These plans will carry the same premiums, but have more variation in cost-sharing provisions than exchange-based options, state officials said.